Having frozen meals on hand means you are always prepared with a quick, convenient meal. But pre-packaged frozen meals at the grocery store are often expensive and high in unhealthy ingredients like salt and saturated fat. to get all of the nutrition of home-made meals with the convenience of having them ready to go in your freezer. Like with any sort of home cooking, planning ahead is essential when it comes to making frozen meals. One way to plan ahead is to pick one day out of the week and spend some time making a meal or two… or three. Then pop them in your freezer in several containers to last throughout the week. Another way to make freezer meals with a little less planning is to intentionally make too much supper. Before you sit down for dinner, put the extra food into a container and into the freezer – just make sure no one takes it for seconds! Can any meal be a freezer meal? Not all meals hold up well to being frozen and thawed. For example, fresh vegetables in salads can turn out mealy. Most meals that are heated throughout when cooking – like casseroles, chilis, and soups – turn out great as freezer meals. Freezers keep food safe for much longer than refrigerators. Most frozen prepared food last 1-3 months in the freezer. Usually, the quickest and best way to thaw a frozen meal safely is by cooking it – in the microwave, oven, or stovetop. Read our previous post to see why is important to safely thaw meals. If you find the idea of freezing whole meals to be too much work, start small. Try preparing parts of your meals ahead of time. For example: if you make muffins on the weekend, put some in the freezer and pull them out a few at a time throughout the week. Freezer burn can give delicious meals strange and unpleasant textures if they are not stored properly in the freezer. Avoid this issue by freezing foods as quickly as possible then storing them in airtight containers. 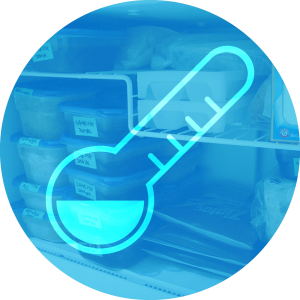 You can cool foods faster so they are less likely to develop freezer burn by portioning them into several containers. Freezer burn may develop over time if frozen food is kept too long. Here is a useful table from the USDA on storage time of common frozen foods.